Aspiring to buy and still look great in your clothes when you are over fifty, can sometimes feel like a real struggle. Its like the high street is split into two camps; the ultra cool, “don’t enter this shop if you are over 25” or the “everything in this shop is beige with an elasticated waist” kind of shop. I’m not ready to join the “fade to beige” brigade just yet, so have compiled my own stylish winter essentials for those of us who are over fifty ( equally applies to stylish ladies of any age though). Always buy the best quality white shirt you can afford. It will see you through all the seasons and is perfect to layer under jumpers and coats in the winter. Buy a longer length, great for skimming the bottom if you are concerned with that part of your body and will also be far more comfy if you want to tuck it in. It won’t ride up or slip out around your waistband. Buy long sleeved to give you versatility. Also if you can find one, buy a white shirt with breast pockets (see above) White shirts can be see through, having pockets on the chest helps to stop your bra showing through and makes the outfit look infinitely more stylish. I know this might seem like a fail safe choice but I have found over the years, if you wear an all black outfit it looks so stylish and always gives the impression of being far more expensive than it probably is. It is important though, to make sure that the shade of black is the same throughout the outfit otherwise the look doesn’t work. Also a piece of statement jewellery (see above) will complete the look. Finding the perfect autumn/winter coat can be a real struggle. There are so many styles and colours available. Trends come and go but the classic camel is timeless. It never dates and looks great on all shapes and ages. You can wear them for daytime or evening, smart or casual. You will always look stylish whether you wear your coat with jeans, a casual jumper and over sized scarf or with a smart work dress, the camel coat is a classic buy. This is where you can have lots of fun. I have lost count of the amount of scarves I own. I have inexpensive ones, mid range silk and cashmere blends and one that would make your eyes water if buying for yourself, a beautiful Hermes scarf that was given to me by a good friend. A scarf is a must winter accessory and can change the whole look of an outfit as well as keeping the chill away from your neck (a particular weak spot for me). There are so many lengths and shapes available these days and an equal number of ways to wear your scarf. Now I don’t know about you, but for me in recent years, finding the perfect pair of jeans that not only fit in all the right places but are comfortable to wear has been almost impossible. I don’t think we ever “grow out” of wearing jeans. My boss at work is in her 70s and still rocks her jeans in the school holidays. I certainly love wearing them at weekends and holidays. Over the last few years though, I have been settling for cheap non brand jeans as I wasn’t very happy in myself and thought it didn’t matter. On a recent “shopping the sales” jaunt, I happened to find a pair of jeans on the sale rail of mint velvet, size 14 regular. OK, I’ll try them on. To say I was stunned by the difference a quality pair of jeans made to how I felt and looked was an understatement. They fit my bottom (and even seem to give it shape, is that my imagination? ) They are comfortable around my tummy and don’t make me feel like I am being cut in half and they fit all the way down my leg with no twisted seams or puckering. I bought the jeans and intend to pretty much live in them through the winter. 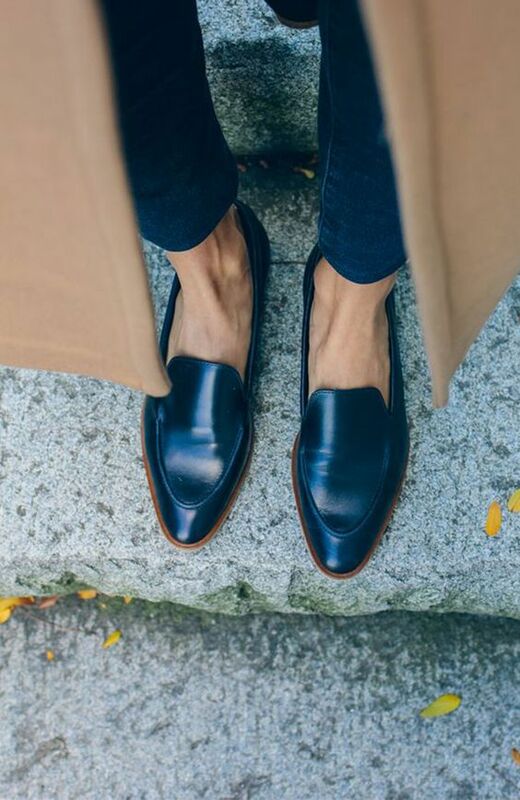 Dressing them up with loafers and a blazer on warmer days and with boots and my camel coat when the weather gets colder. An essential in my wardrobe all year round. The breton top has been a classic since Coco Chanel introduced it to her range. It suits all shapes and sizes (and yes you absolutely can wear horizontal stripes if you are a larger lady). Layer it up with jumpers and scarves or wear it with a blazer and scarf on warmer days. Looks just as classy worn with jeans or, as I did last Christmas day, with my navy blue sparkly sequin skirt. Always, always buy the best quality black shoes , boots and handbag you can afford. They will be a main stay when the fashion trends and colours are long gone. I have been a lover of the Italian brand Tod’s for many many years, ever since I first saw Princess Diana wearing her tan loafers and carrying her oversized tan Tod’s shopper. I obviously have never been able to afford to buy them brand new direct from the store but did realise my dream on a holiday to Florida where I came across a Tods outlet and purchased my first handbag for the sum of £300 !! My mother bought me my first pair of Tods loafers for my 40th birthday and I only threw them out two years ago ! Proving that quality is always better than quantity. Hope my stylish winter essentials have given you some inspiration and please do follow my #Over50 hashtag on pinterest, facebook and twitter. I would love to hear any great tips or advice anyone else might have for those of us over 50 who are determined to grow old stylishly.